Director Cary Fukunaga has given a new generation a gorgeous version of this classic tale. Since its publishing in 1847, under the pseudonym Currer Bell, Jane Eyre has fascinated both readers and storytellers. This adaptation is beautifully shot, very well-acted, and enhanced by a stunning score from Dario Marianelli (Atonement, I Capture the Castle). The set of Thornfield is perfect. It’s devastating and romantic and even funny at times. And until the last third of the movie, I thought someone had finally made a perfect adaptation. But, like Jane, my dreams were dashed, made all the more painful because I had dared to hope at all. Yes, everyone has a favorite scene that they can’t wait to see on the big screen. Or a line that doesn’t match quite with their imagination. But this goes beyond minuscule details. Even more frustrating, many of these key scenes were shot, but edited out (Luckily you can see them in the extra features). There are no scenes that hint at or show Bertha until the failed wedding. Although Bertha does try to set Mr. Rochester’s bed on fire, there are no cackles from the hallway, no unholy screams that keep Jane awake. There is no Grace Poole as a red herring. There isn’t a hint of the supernatural or any idea that something is amiss. Most frustrating, is the lack of the veil shredding scene. 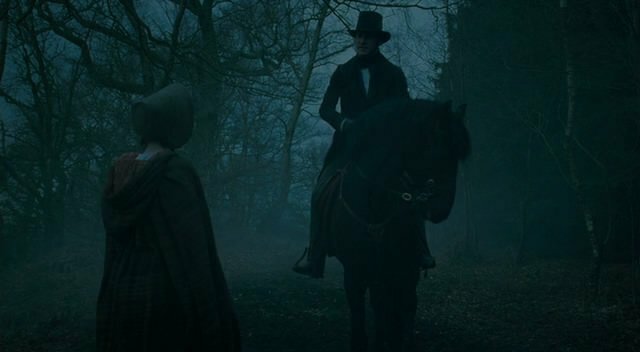 It jumps from Adele playing with the veil to Jane and Rochester heading to the church. I think the lack of these scenes undermines Jane’s character and detracts from the richness of the story. The uncertainty, the unsettled atmosphere is key to Jane Eyre. Without it, it becomes little more than a “will they or won’t they” story. There are also some important elements of Mr. Rochester’s character that are left out. Though shot, but cut, there is a scene in which he describes his connection to Adele’s mother. I found Wasikowska and Fassbender’s chemistry most evident during this scene, but it was inexplicably cut. And Rochester’s speech at the altar? Nowhere to be found. He merely takes the wedding party to his attic, for our first glimpse of a woman who looks methed out. In short, what IS there on screen, is beautiful and well done. The problem is it leaves what I consider essential scenes out. Do see it; it was very enjoyable. Just know that somethings are missing. I suppose I am only all the more disappointed knowing how very close to perfection they came. Thanks. That was a good review.